Today is the first day of the penitential observance known as the Lesser Rogations, and also, by coincidence, the feast of St Mamertus, bishop of Vienne in France, who first instituted them around the year 470 A.D. His successor but one, St Avitus, has left us a sermon on the Rogations, in which he describes the reason why they were instituted, in the wake of a series of public calamities. Two points call for special note. One is that St Avitus acknowledges that the Rogations were not originally celebrated by everyone on the same days, but later agreed upon the triduum before the Ascension. Rome itself at first only celebrated the Greater Rogations on April 25, but received the Lesser ones from Gaul in the Carolingian period, and as part of the Roman Rite they were then extended to the whole of the Western church. The one exception is the Ambrosian Rite, in which they are celebrated on the Monday, Tuesday and Wednesday after Ascension, and with greater austerity as far as the liturgy is concerned than in the Roman Rite. The vestments are black, the standard Milanese color for the ferias of Lent, and in the Divine Office, all of the proper characteristics of the Paschal season (e.g., antiphons consisting only of the word “Hallelujah”) are suspended. 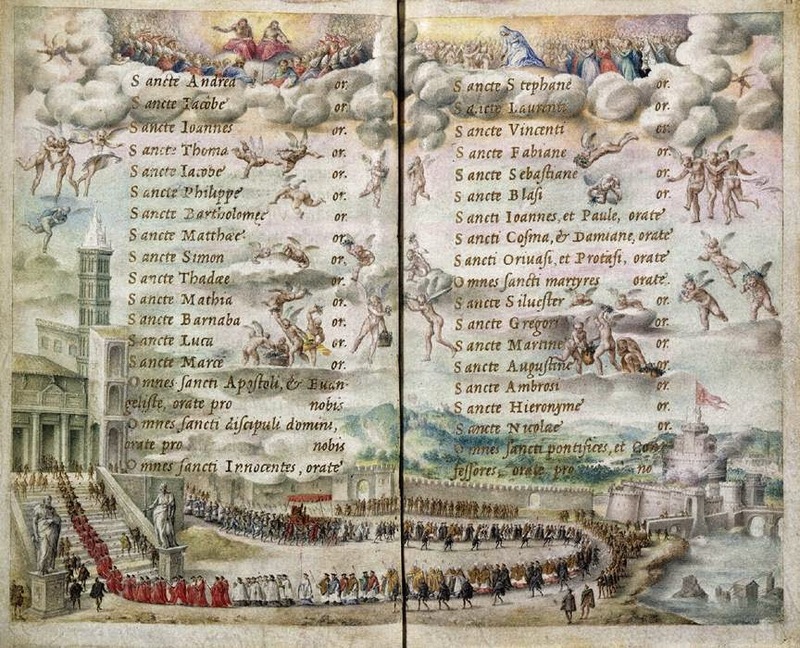 Two leaves of the Farnese Hours, showing a penitential procession and part of the Litany of the Saints. Painted by Giulio Clovio for Card. Alessandro Farnese, in 1546; now in the Morgan Library in New York City. Therefore, as God inspired the hearts of the repentant, (his plan) is heard by all, confirmed and praised. These three days are chosen, which occur between Sunday and the feast of the holy Ascension, … (and) declares the prayer of the first procession at the basilica which was closer to the city’s walls. 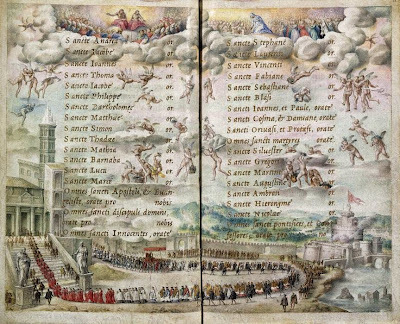 The procession goes with the fervor of a great multitude, and the greatest compunction, … But when the holy priest from the accomplishment of these lesser things the signs of greater things to come, on the following day, the custom which we about to do for the first time, tomorrow, if the Lord will it, was established. In the days thereafter, some of the churches of Gaul followed this worthy example; but it was not celebrated by them all on the same days as it was established among us. Nor was it very important that a period of three days be chosen, provided that the services of Psalms be completed with annual functions of penance. Nevertheless, as harmony among the bishops grew, together with love for the Rogation, their concern for a universal observance brought them to one time, that is, these present days.